The Enfield State Fish Hatchery was established in 1909 and moved to its current location in 1958. 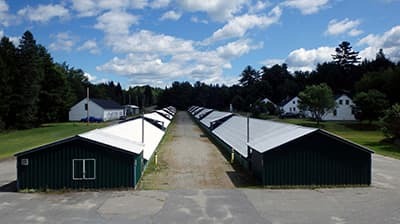 The current facility, with concrete raceways and a gravity fed water supply, was constructed in 1958, replacing smaller facilities located near the outlet of Cold Stream Pond. The original influent water filtration system was installed in 1976 with ultraviolet light treatment added in 1978. Both systems were replaced in 2011 with new buildings and equipment. Other major improvements include raceway covers in 1970, a bulk oxygenation system added in 2004 and effluent microscreen filtration with a clarifier and solids storage installed in 2005. Water for the facility is supplied by Cold Stream Pond through a dual intake system. Species reared at the Enfield facility include brook trout and landlocked salmon. Enfield serves as a key broodstock facility holding two separate strains of brook trout brood. There is also a hatchery isolation room for special projects involving wild fish. The facility is the second largest State production facility with 36 covered 100' x 6' raceways.